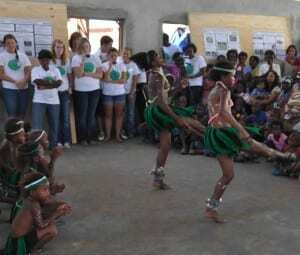 Visitors that come stay in the guest house and volunteers live at the Indlovu Project generate a large portion of the revenue for the Indlovu Project. For this reason it is important that these parts of the project be carefully constructed to ensure a great experience for all visitors at the Indlovu Project, whether overnight guests, or volunteers staying for several weeks. The volunteer program at the Indlovu Project is very new, but a crucial part of the project’s operations and one that needs to be nurtured as the project grows. Volunteers bring new energy to the project, provide valuable assistance in a number of areas and help support the project monetarily through paying to live at the project. As part of the sustainability plan written for the Indlovu Project, our team did an analysis of the volunteer program that is currently in place. After meeting with three current volunteers at the project it came to our attention that there are a few areas of the volunteer experience that can be improved upon. After contacting a number of past volunteers, and our own overnight experience staying at the Indlovu Project, the areas that we focused on improving were the living arrangements, activities outside of volunteering, orientation to the project and the volunteer program structure. Our work led to the drafting of several volunteer program suggestions. The guest house that is currently under reconstruction will be a key part of the Indlovu Project. When complete, it will hold 12 guests, creating the opportunity for a substantial amount of income to be generated. In order to maximise the revenue generated by the guest house, it must be ensured that the overnight experience is one that people will enjoy and recommend to friends. The Indlovu Project can offer an authentic township experience quite unlike other lodges or guest houses. Our team met with Dianne Womersley and Hazel Bartman, the newly appointed Director of Hospitality for the Indlovu Project, to brainstorm a number of ideas for the new guest house. These ideas included many ways to improve the guest experience such as providing transportation to and from various tourist attractions around Cape Town, providing welcome information packets in all of the guest rooms, addressing safety concerns and different options for providing meals to guests. We did some further research, developed the ideas brought up in this conversation further and wrote a number of suggestions for the guest house.